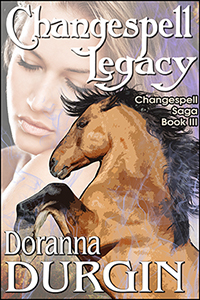 Dun Lady’s Jess–all horse, all woman, all heart…and the only one left who can save her disintegrating world from magic gone awry. Arlen of Anfeald is dead–or so his friends believe, for Camolen’s Council of Wizards has been cut down in a treacherous ambush of twisted magic…and the only surviving witness is a palomino stallion named Ramble. Convinced that the twisted magic is a threat to all of Camolen, Carey–Anfeald’s Head Courier–plans to question the palomino, using the now-forbidden spell that can change a horse into a human. This is the same spell that once turned Dun Lady’s Jess from horse to human as it took her from one world to another–from Camolen to the American Midwest. But once Cary, Jess, and the palomino leave Camolen, racing to obtain the crucial information that can save their world, the damaging magic spreads, blossoming to engulf the unwary and corrupting even the simplest of spells. Even the spell that can take them home… .